The Calico Cat is a gift and antique shop in Canadian. 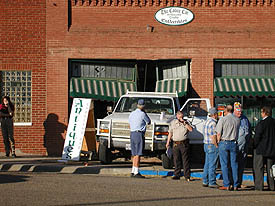 The building was in good repair, but early one morning an improperly parked pickup truck rolled down the street into the storefront. Although no one was hurt, there was substantial damage to the building- some cosmetic and some structural. Alley Woodworks worked with the owners and the insurance company to quickly rebuild the storefront and damaged interior. Masons rebuilt the brickwork, Alley Woodworks rebuilt the door and windows, trimmed, plastered, and painted. The owners cleaned and dusted and replaced lost stock. The goal was to efficiently restore the building to its most recent condition. 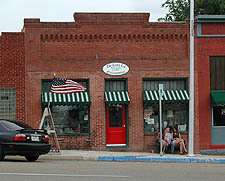 The shop was reopened in time for the Fourth of July holiday.